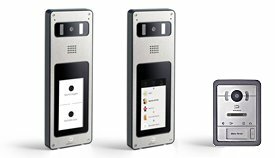 Telephone and Video Surveillance has utilised TCP/IP technology for some time but by combining Italian design flair and proven Android Technology, InfinitePlay bring you the next big leap in audio/video door entry systems. InfinitePlay entrance panels are designed to withstand vandalism, heavy rain and the worst weather. The front cover is made from AISI 316 Scotch Brite brushed stainless steel to resist even the most aggressive atmospheres. Glass parts are made from ultra-strong, scratch-proof glass. Z1001 with illuminated name buttons for 1 to 4 user systems. Z100D with touch-screen for scrolling name searches and for displaying additional information like the floor and staircase number of offices. Thanks to touch-screen technology, there are no limits to the number of internal users. Z1101 compact panel in 1-button and 2-button versions. The generous 4.3” sun-readable display allows users to communicate with visitors via images and status messages (e.g. "calling”, "talking”, "door opening”, "call ended”). You can also record an automatic answer on your video door phone to display to visitors at the entrance panel. This is an extremely useful function for shops and offices wishing to display their opening days/times. The microphone uses noise cancelling technology to eliminate background noise from busy roads and the touch-screen display also provides a numeric keypad for opening doors by entering a pre-programmed code. Doors can also be opened via the InfinitePlay app on your smartphone. The ZK17D 1-button Door Entry Kit features a brushed stainless-steel entrance panel with high resolution 5 megapixel colour camera and a 7" capacitive touch-screen monitor which is based on Android technology and includes an internet browser. The entrance panel and internal monitor are each powered by PoE (Power over Ethernet) through a single CAT5 cable connecting each the 5-port power supply server (included) which in turn can be optionally connected to a local network or internet router for internet connectivity. The ZK27D 1-button Door Entry Kit features a brushed stainless-steel entrance panel with high resolution 5 megapixel colour camera and a 7" capacitive touch-screen monitor which is based on Android technology and includes an internet browser. A black monitor is available as an option at no extra cost - please order ZK271.40 . The ZK171 1-button Door Entry Kit features a brushed stainless-steel entrance panel with high resolution 5 megapixel colour camera and a 7" capacitive touch-screen monitor which is based on Android technology and includes an internet browser. A black monitor is available as an option at no extra cost - please order ZK171.40 . The ZK117 1-button Door Entry Kit features a brushed stainless-steel entrance panel with high resolution 5 megapixel colour camera and a 7" capacitive touch-screen monitor which is based on Android technology and includes an internet browser. A black monitor is available as an option at no extra cost - please order ZK117.40 . The ZK127 2-button Door Entry Kit features a brushed stainless-steel entrance panel with high resolution 5 megapixel colour camera and a 7" capacitive touch-screen monitor which is based on Android technology and includes an internet browser.